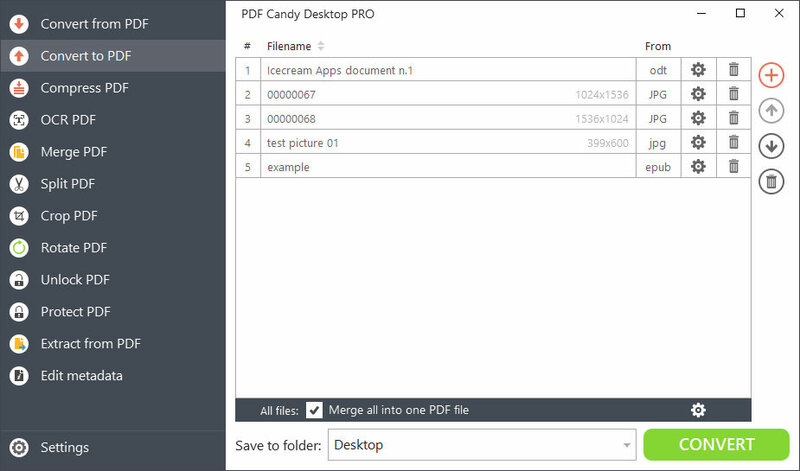 PDF Candy Desktop is a powerful software with plenty of tools to work with PDF files. Thanks to intuitive user-friendly interface and modern design, it is very simple to use this program. Drag and drop mechanism is supported. It's possible to add password-protected PDF files (a valid password per each file is required) and to preview all the added PDF files. 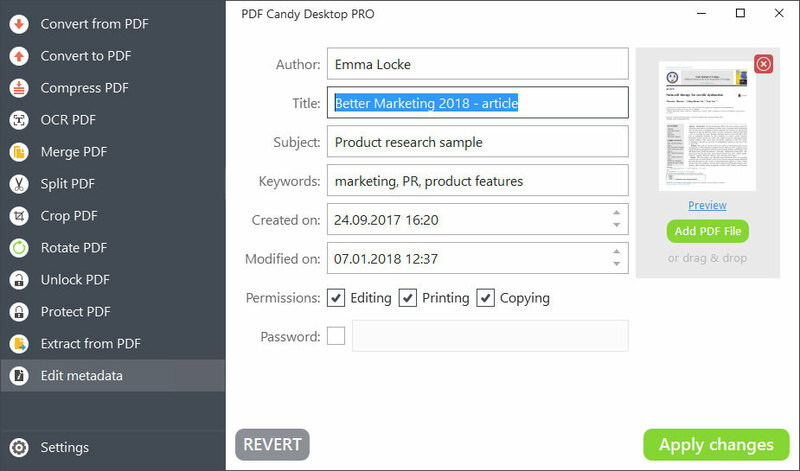 Convert from PDF mode of PDF Candy Desktop converts input PDF files to files of supported output formats: text (DOC, DOCX, RTF, ODT), images (JPG, BMP, TIFF, GIF) and EPS, WMF. Convert to PDF mode supports conversion of documents (DOCX, XLS, XLSX, ODT, ODS), ebook files (ePub, MOBI, FB2), images (JPG, PNG, BMP, TIFF) and HTML and HTM files to PDF. All the files added to the queue can be merged into a single PDF if needed. There are also advanced options to set for output PDF files. Compress PDF mode offers a way to compress the added PDF file in 1 mouse click. OCR PDF mode is a way to digitize scanned documents and convert them to DOC, DOCX, RTF or ODT formats. It is possible to select the language of OCR for the best conversion results. Merge PDF mode will help users to easily merge multiple files into a single one. Advanced settings for the output PDF are available. 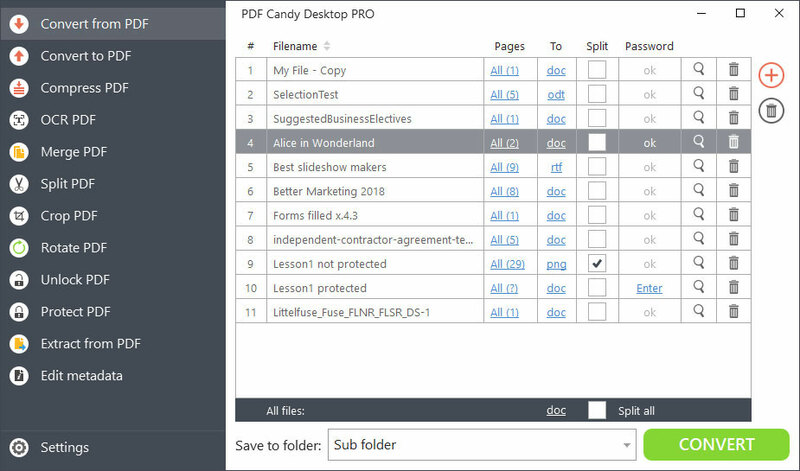 Split PDF mode has 4 various split modes to choose from. One can delete the pages from PDF, split a file into single pages, split the file by groups of pages or by page ranges. To crop a PDF one needs to upload a file and manually place the new borders to be applied for the output files. To rotate a PDF with Rotate PDF tool simply set a rotation angle (90, 180 or 270 degrees). Unlock PDF tool removes the protection from PDF if a valid password is inserted. Protect PDF applies a password to a selected PDF file. Extract from PDF is a tool that can extract either text or images from the uploaded PDF documents. Edit metadata mode edits such PDF metadata as author, title, subject, keywords and dates of creation and modification.